BMLLEN is working in partnership with Reach to create an event not to be missed for young people and parents. 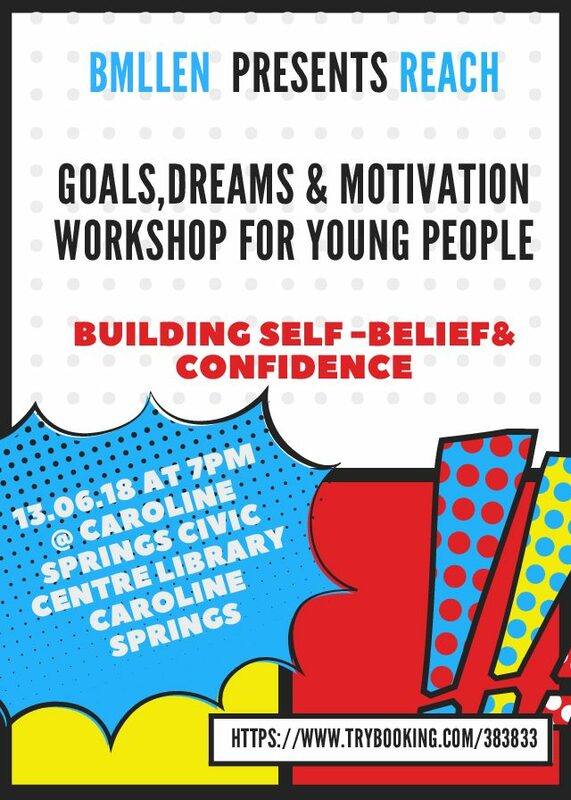 The Workshop is titled Goals, Dreams and Motivation and explores students self-belief and confidence. Participants are encouraged to identify their passions and dreams and understand the importance of goals in developing self-motivation. Underpinning the design and delivery of all workshops is a framework of professional wellbeing support to ensure emotional safety and positive youth connections. The workshop aims to enhance self-awareness and techniques for individual goal setting. We have aimed to keep the workshops local to Brimbank/Melton areas and as central as possible to both. We would love your support by attaching our one page flyer promoting this event with your newsletter distribution to students and parents. The event is likely to be popular so booking is essential via the TRY BOOKING website. If there are any further queries Parents are encouraged to contact Di @ BMLLEN on 9361 9325.